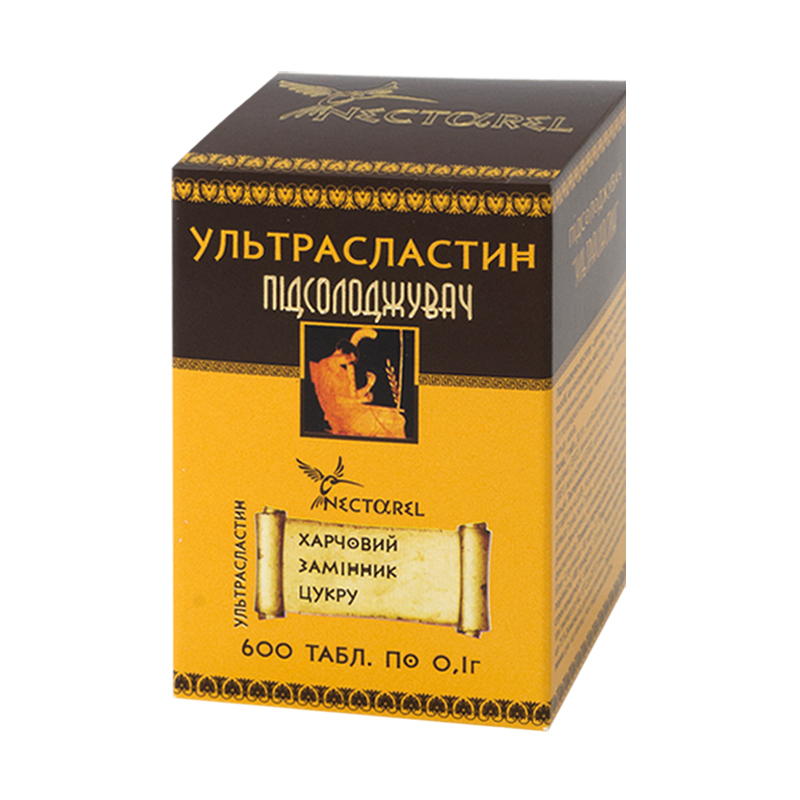 It is recommended as a sweetener for people with diabetes mellitus and for persons, controlling their weight. Sodium bicarbonate, tartaric acid, saccharin, aspartame, potassium acesulfame, potato starch, calcium stearate. Sweeteners, contained in Ultraslastin, are selected in such a composition and in such a ratio, so as to provide for maximum sweetness coefficient. Cyclamate is a calorie-free sweetener, which is 30 times sweeter than sugar. Saccharin is a calorie-free sweetener, used for food and drinks sweetening, which is 200-300-times sweeter than sugar. Acesulfame is a calorie-free sweetener, which is 130-200 times sweeter than sugar. Aspartame is a low-calorie sweetener, which is approx. 200 times sweeter than sugar. These sweeteners are taken up in the body either in a very restricted amounts (cyclamate, aspartame) or are not taken up at all (acelsulfame and saccharin) and are directly excreted by the kidneys. Due to their high efficiency and safety they were approved by the Joint FAO/WHO Expert Committee on Food Additives (JECFA) and the EU Scientific Commission on Food and found their application in over 90 countries of the world. When combined, their synergetic effect is increased. One 0.1 g tablet corresponds to the sweetness of 1 teaspoon of sugar. Take maximum 20 tablets a day. It contains the source of phenylalanine and is not recommended for patients with phenylketonuria. It is not recommended for the pregnant, children under 7. Children in the age over 7 use the supplement as prescribed. It contains the source of phenylalanine and is not recommended for patients with phenylketonuria. Proteins – 0 g, carbohydrates – 68 g, fats – 0 g.